By now it is public knowledge that there will be no replacement for Google's public transportation routes built into the Apple Maps in iOS 6. Indeed, if you're holding an an iPhone running iOS 6 (that somebody maybe has left in a bar) and you try to plan a route from point A to point B you'll find that you can drive there easily using Apple Maps' turn-by-turn 3D navigation. You can get walking directions. Or you can jump to sections—it doesn't exist yet, by the way—that will supposedly show you a list of transit apps that can draw a route for you instead. I have some personal experience which underlines why leaving transit directions out of Apple Maps is actually the only reasonable move. Many moons ago in Vienna, Austria, Google Maps introduced public transit directions. It was great because it helped people navigate through the city with ease. First here's a little background on Vienna's public transit: In Austria the public transit system has been more or less privatized, though, it is still has very close ties to the government and politics. Public transit inside the bounds of Vienna is owned and operated by "Wiener Linien", everything outside this territory and the whole rail system is owned and operated by "OEBB". Those sound like various independent companies, but in reality there are lots of political ties between these players. For a while, everybody was happy and Google was provided the data in the necessary format which had been specified as the de facto standard called Google Transit Feed Specification. As long as information is provided in that standard, you can get public transit directions in Google Maps. We can only speculate as to the exact course of events, but in short, everything went wrong. Let me we lay out some facts for you first. A startup based in Vienna launched an extremely crappy app called Qando which often responds with completely useless routes. Not only does it fail to sound cool by omitting a U ("Quando" is Italian and means "When? "), it nevertheless triggered a change of mind at "Wiener Linien". Or was it because OEBB licensed an app from German HaCon which became the official OEBB routing app named SCOTTY mobil, just like the website. I heard rumors that this was a result of a backroom deal aimed at neutering Google's power by making Google Maps worthless for navigation in Vienna. And, thus, two apps became the only sources of routing information in Vienna. So even though Google was "working hard" they never stood a chance against the secret deal between several monopolistic companies. Since then (spring 2010) no progress was made. There was an Open Government initiative, but since Wiener Linien and OEBB don't belong to the government (at least on paper) they can drag their feet as much as they like and still never provide their transit data to any outsider. The truth of the matter is that if private companies are in charge of public transit and they have vested interests in pushing their own (or partner's) apps, then they have little to no incentive in providing GTFS data to Google. One might think that easy availability of routing info via Google Maps might increase these transit companies' income, but at least the two big Austrian transit authorities do not seem to agree. Now imagine what Apple would do. It is obvious that they want to cut Google out as a middle man and make deals with the likes of Tom Tom instead. Unfortunately there is no global company that Apple could go to for this kind of data. And why should anybody let Apple have more data than Google is getting? Even worse, nobody knows the extent of the secret deals that were made to keep Google out of certain markets. Those same deals would probably also make it impossible for Apple to get at this data. In a way Apple has to be thankful to Google for testing the waters and uncovering how difficult it is to get worldwide coverage on a voluntary (and free) basis. Because of this Apple does the only smart thing: let the companies do it themselves. For Austria I am pretty sure that you will end up seeing Qando and SCOTTY on this list of public transit routing providers. There will most likely be a way for the new Maps to pass on the start and end coordinates to the app you end up choosing and then you will get the routing info from there instead of being integrated in Maps. 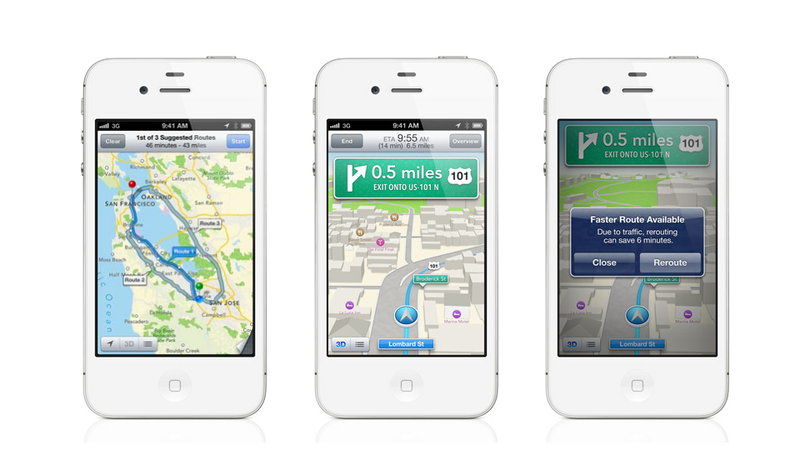 Or maybe there will be a way to expose the discovered route somehow inside the maps app. But for this to happen Apple needs to provide some sort of communication process between apps, above and beyond URL schemes. So the app context switch is the more likely variant. By rolling over the responsibility to the local transit companies Apple makes the smart move of forcing the users to talk to their local companies if they want to trigger an acceptable routing experience from within Apple Maps. Apple creates a "negative space", an obvious void that is just begging to be filled by multiple apps competing to be the public transport info provider of choice for the user. At the same time they are creating an incredible business opportunity to either create the official transit apps for certain areas or to create a premium transit app that competes with some crappy incumbent app. Transit is something very personal, because people tend to use public transport every day to get to and from work. While Google's answer was to create a system by churning data feeds, Apple's is much simpler: There's an App for that! Oliver Drobnik (@Cocoanetics) writes a blog on Cocoanetics.com, which is a mix of iOS-development articles, news and commentary.